Dr. Laura Molgaard is the Associate Dean for Academic and Students Affairs at the University Of Minnesota College Of Veterinary Medicine. She is a 1991 graduate of the Iowa State University College of Veterinary Medicine. After graduation, she was in small animal private practice before moving into teaching at a veterinary technician program for several years and joined the UMN CVM in 1997. 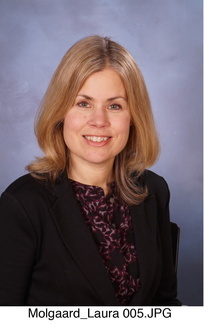 Dr. Molgaard’s research interests include selection for and development of non-technical competencies, technology enhanced learning and outcomes assessment. Her interest in diversity includes veterinary pipeline development, admissions, and culture/climate. 1.AAVMC Working Group on Competency-Based Veterinary Education, Molgaard LK, Hodgson JL, Bok HGJ, Chaney KP, Ilkiw JE, Matthew SM, May SA, Read EK, Rush BR, Salisbury SK. (2018) Competency-Based Veterinary Education: Part 1 – CBVE Framework. Washington, DC: Association of American Veterinary Medical Colleges. 2.AAVMC Working Group on Competency-Based Veterinary Education, Molgaard LK, Hodgson JL, Bok HGJ, Chaney KP, Ilkiw JE, Matthew SM, May SA, Read EK, Rush BR, Salisbury SK. (2018) Competency-Based Veterinary Education: Part 2 – Entrustable Professional Activities. Washington, DC: Association of American Veterinary Medical Colleges. 3.Molgaard LK, Read EK. Learning through Peer-assistance and Coaching, In: Hodgson JL, Pelzer JM. Veterinary Medical Education: A Practical Guide. Wiley. April 2017. 4.Molgaard LK, Root Kustritz MV, Rendahl A. 2015. Closing the Loop: Using evidence to inform refinements to an admissions process. Journal of Veterinary Medical Education. 42 (4): 297-304. 5.Molgaard LK and Lewis RE. 2008. The use of a structured interview guide in veterinary college admissions, Journal of Veterinary Medical Education, 35 (3): 460-465.